It’s the dead of summer and you find yourself all heated up because your air conditioning doesn’t appear to be functioning as it should be functioning. While one of the most common issues with air conditioning is an improper operation, there can be a number of other causes of finding yourself with a unit that is not leaving you very cool. Start with making sure all of your doors and windows are closed when the unit is turned on. And, check the installation to make sure it was installed properly and doesn’t have any leaky ducts or low airflow. Refrigerant Leaks.if you notice your air conditioner is low on refrigerant, it could have a leak. And, simply adding more refrigerant won’t fix the problem. Check to make sure that the unit wasn’t undercharged at the time of installation as this could impact the efficiency of the unit as well. If you aren’t sure about the leak or how to ensure the charge is correct, call a reputable air conditioning service provider to take a closer look and remedy the problem for you. Less than desirable maintenance. It’s important to ensure that filters and coils are kept clean or the air conditioner will not function properly and may even fail prematurely. Be sure to have all of the electrical connections and contacts checked out during your regular service call as corrosion of wire and terminals is a possibility over time. If your unit turns on and off frequently, it could cause the compressor and fan controls to wear out as well. You can get good advice on the operation of your air conditional from your professional service provider. Sensor issues. If the sensor on your unit is knocked out of position it could cause the air conditioner to cycle constantly and behave erratically. Check the location of the sensor, or have a professional check the location for you to ensure that it is near the coil, but not touching it. Check the drain. If it’s humid outside, be sure to check the condensate drain to make sure it is free from clogs and is draining as it should be. Proper maintenance and operation is the key to a longer lasting air conditioner. 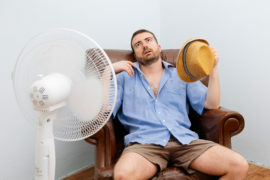 Give us a call if you have any questions about maintenance or are ready to stay cool with a new unit. We’re here to help! All About Air Conditioner FiltersJust What Is Rooter Service Anyway?